Integration of molecular structures as active components in electronic circuits is a visionary concept and a scientific challenge at the same time.The predicted attainable feature sizes together with the potential cost to performance relationship are the main driving forces of this molecular approach to electronic functions. However, the field is still in its infancy and the investigation and comprehension of the relationship between molecular structure and electronic transport properties are the most important tasks for further developments. Studies of molecules in electronic circuits are strongly interdisciplinary with synthetic chemistry and experimental physics as key players. The chemistry deals with the design and the synthesis of tailored molecular structures for both, the envisaged experiment and also particular electronic functions. A tailor-made rod-like molecule comprising an emitting naphtalene-diimide dye core, solubilizing spacers and anchoring groups was synthesized to bridge a gap in a nanotube inserted between two electrodes. 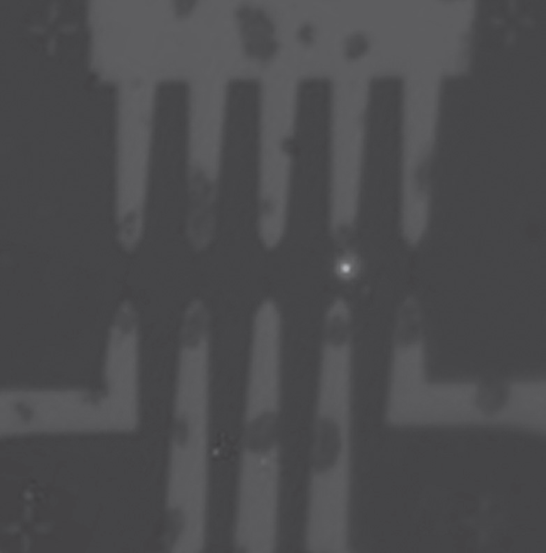 The molecule was translocated by dielectrophoresis and trapped in the biased nanotube nanogap from solution. Electroluminescence from the molecule under voltage bias was detected and could be recorded using an optical microscope (see picture). 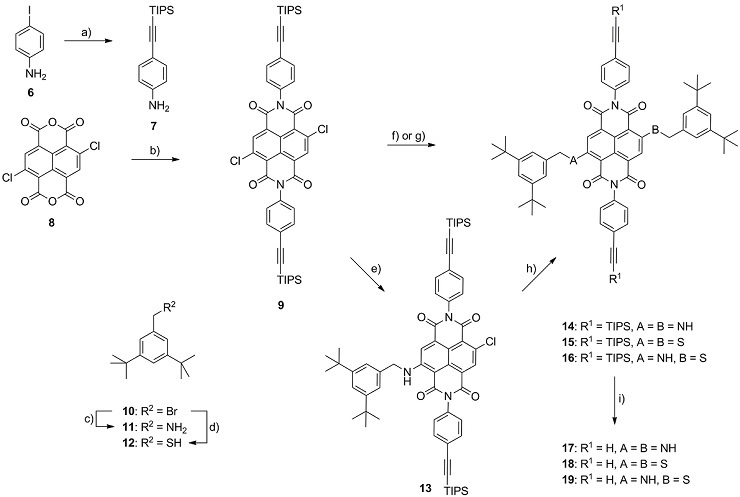 Scheme 1: Synthesis of the NDI fluorophore building blocks 17-19. Reagents and conditions: a) (triisopropylsilyl)acetylene, Pd(PPh3)2Cl2, CuI, TEA, THF, r.t., 93 %; b) AcOH, 7, 120 °C, 63 %; c) 1.) phthalimide, K2CO3, DMF, r.t., 2.) H2NNH2·H2O, THF, r.t.→70°C, 99%; d) 1.) KSAc, THF, r.t., 2.) K2CO3, MeOH, r.t., 72%; e) 11, K2CO3, DMF, 40 °C, 54 %; f) 11, DMI, 100 °C, 73 % 14; g) 12, K2CO3, DMF, r.t., 93 % 15; h) 12, K2CO3, DMF, r.t., 86 % 16; i) TBAF, THF, r.t., 67% 17, 74% 18, 58% 19. Scheme 2 : Synthesis of the OPE molecular wire 41. Reagents and conditions: a) 6-bromohexane, K2CO3, CH3CN, 95 °C, 54 %; b) KIO3, I2, AcOH, H2SO4, 115 °C, 95 %; c) HCC-CPDMS, PdCl2(PPh3)2, PPh3, CuI, piperidine, r.t., 32 %; d) HCC‑TMS, Pd(PPh3)4, CuI, NEt3, 95 °C, 95 %; e) K2CO3, MeOH, r.t., 92 %; f) 33, Pd(PPh3)4, CuI, (iPr)2NH, THF, 45 °C, 91 %; g) K2CO3, THF/MeOH, r.t., 63 %; h) 33, Pd(PPh3)4, CuI, (iPr)2NH, THF, 45 °C, 91 %; i) K2CO3, THF/MeOH, r.t., 90 %; j) 32, Pd(PPh3)4, CuI, (iPr)2NH, THF, 60 °C, 80 %. 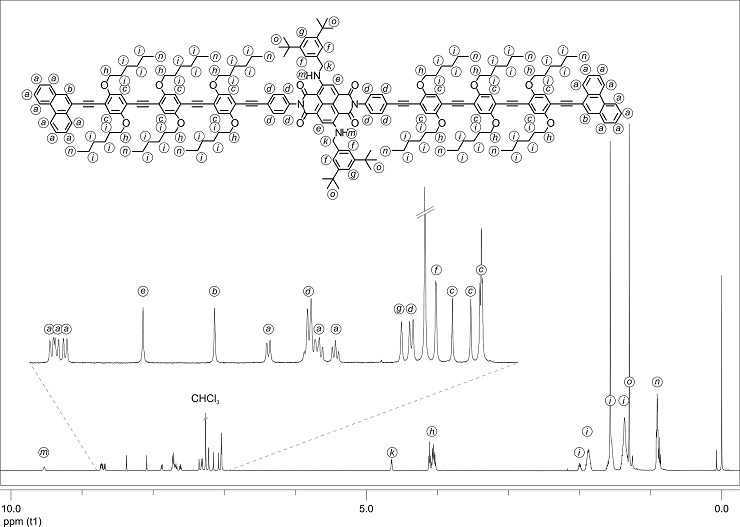 Figure 1: 1H-NMR spectrum of the NDI rod 3 in CDCl3 at r.t. The signals were assigned to the different protons.